Kanoni. All photos by Caroline Lubbers. 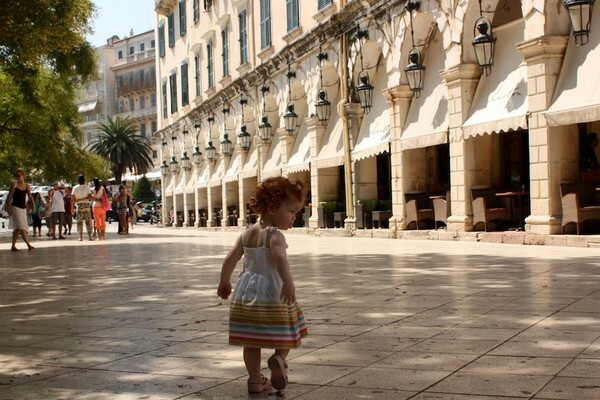 Love first brought Caroline Lubbers to Corfu, the island off the coast of northwest Greece and Albania. She's returned every year since for the beautiful beaches, lush green hills, and intoxicating spirit. Here's what to do to find all that and more. 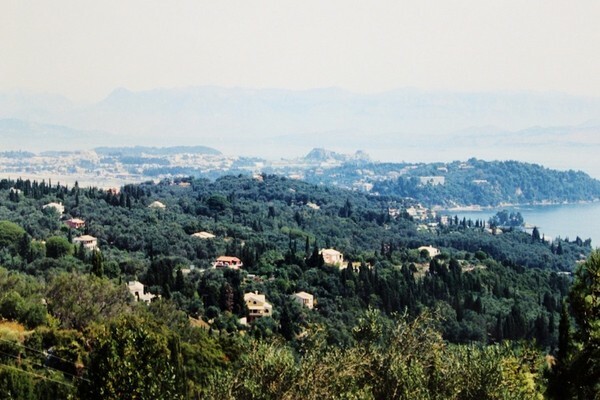 CORFU, Greece – Love first lured me to Corfu. My husband's father was born on the island and his family remains rooted there. A few weeks into our courtship, my husband invited me for an extended stay in the family house and, as they say, the rest is history. More than a decade later, we continue to return annually, and I try to plan it so our visits coincide with the ripening of the fig and necatrine trees in the front yard. When one conjures images of Greek islands, the iconic white buildings and blue roofs that grace postcards and calendars come to mind. Honeymooners and cruise passengers usually flock to the well-known cluster of islands off the southeastern coast of Greece. 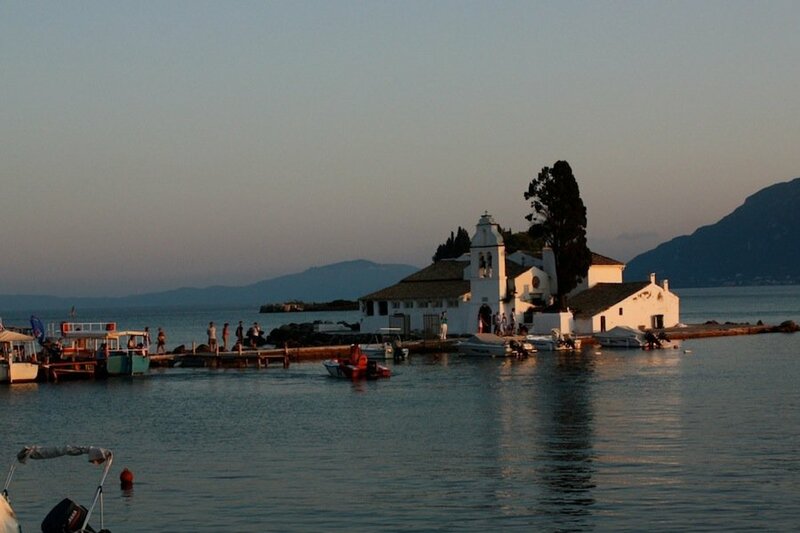 But Corfu, tucked along the northwest coast in the Ionian Sea, is one of Greece's true treasures. Known to locals as "Kerkyra," it's attracted luminaries, dreamers, writers, and royalty throughout history. Who wouldn't be enchanted by these amazing beaches, lush green hills, and the island's whole intoxicating spirit? Corfu, like so many Mediterranean islands, has been tossed around among various empires for thousands of years. The result is an unusually eclectic mix of architecture. In the main city, Corfu town, winding streets are lined with ancient Venetian-style buildings that are interrupted by numerous Byzantine Greek Orthodox churches. The Italianate arched colonnade and plaza sit directly across from a square with a Roman-style rotunda and a cricket field installed by the British. History oozes from every corner, fruit trees and bougainvillea burst from the fertile land, and golden sunlight bathes every inch. The author on the beach. History, of course, is only so much of a siren call. If ever there was a place to go beach hopping, Corfu, with more than eighty beaches, is it. The coastline varies greatly, offering an unfathomable range of scenery and styles: sandy to rocky, secluded to party central. Here's a , but these are my favorites. One of the most popular beaches, Glyfada has fine sand and is surrounded by tree-covered cliffs. Large rock formations jut out of the gorgeous, clear water. The crowd is young and the music is loud. Though families are welcome, this is the beach to see and be seen. A bay enclosed by two mountains that's famous for its crystal-clear water. Faith and force have converged in the area: One mountain holds a monastery that dates from 1255 and is open to the public; the other mountain protected a submarine base during World War II. The blue bay has a number of beaches, some sandy and others pebbled. Located on the east coast, Barbati is hugged by lush, green hills that dip into dark blue water. The beach is comprised of smooth pebbles and can be reached by car or, even better, by boat. The water is deep: Ideal for anchoring and swimming to shore. At just under forty miles long, Corfu is the second largest Greek island after Crete. With the varied landscapes, rich history, and many beaches, you can spend a week exploring the island and still wish for one more day. Rent a scooter or car and go on a journey. Corfu is big enough to explore, but not big enough to get lost. Choose a direction and drive through the olive trees and along the coast. You'll find tavernas and beaches around every turn for pit stops and refreshing swims. Pass the tourist junk shops and keep winding through the old streets until you come to the cafes, bookstores, leather goods shops, and jewelers. It's worth spending a day in town if only to admire the architecture. An arched promenade on the edge of town lined with cafés where locals sit, drink, and talk for hours. Order a frappé (Greek iced coffee), sit back, and people watch. Spend a few hours at , ten kilometers southwest of town. It was built in the late 1800s by Empress Elisabeth of Austria ("Sissi"), who wanted to "escape the tragedies of her life." 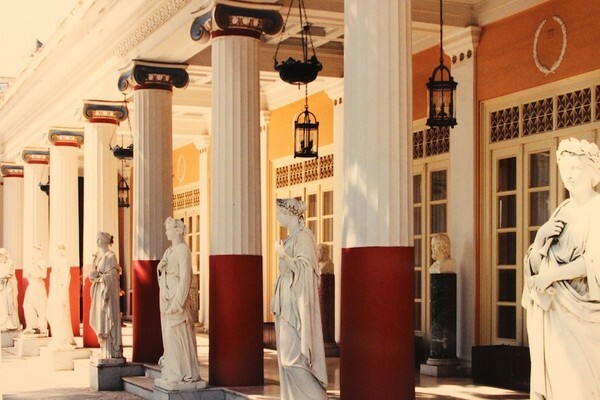 Come to soak up a little history and see how royalty once lived. 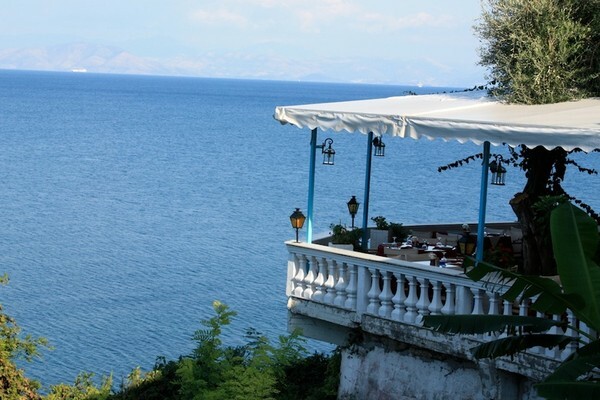 Greeks love coffee time with friends, and one of Corfiots' favorite spots is an area called Kanoni, where café patios overlook the bay, and the landmark Pontikonissi, a small church and monastery. When visiting Corfu, I always stay with my in-laws, but lodging options range from resort hotels and boutique inns to rental yachts. Corfu town's central location makes a nice base for exploring the island; the north side has a more secluded feel for quiet, relaxing vacations. A traditional, four-star hotel that is walkable to town but far enough to feel you're outside the tourist hussle and bustle. 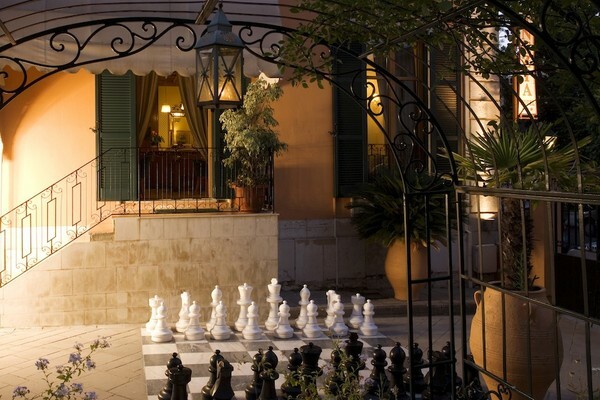 A townhouse built for old Corfiot gentry that was recently converted into a boutique hotel located in the heart of Corfu town. Located twenty minutes north of Corfu town, the luxury resort is perched on a rock and appears to rise out of the water. The hotel has beachfront, pools, and bungalows for those seeking more privacy. If you are looking to stay put when you arrive, this hotel is a short distance from Paleokastritsa's beaches. Or just bob around in the infinity pool and soak in the views of the mountains and sea. They're available everywhere, but the best area is the northeast side of the island, where the hillside offers breathtaking views and the water is reliably warm enough to swim. Apartment rentals are also plentiful but tend to be sparsely decorated. If you only eat one thing on Corfu, find this small bakery off San Rocco Square in Corfu Town and indulge in . You will likely wait in a line out the door, and, when it's your turn, you'll receive a hot square of flakey pie straight out of the oven. 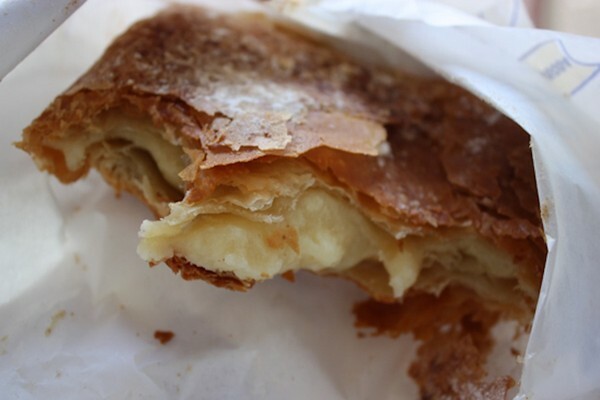 I flip for bougatsa, the custard-filled specialty. Locals come to stroll, play, and fish in the evening hours along the water in this neighborhood and frequent a number of restaurants with outdoor seating under large pine and eucalyptus trees. Order mezethes, small plates of local and traditional specialties. A few times per week, you'll be treated to traditional, live music. A small restaurant on a small beach in the village of Agni that has been run by the same family for more than a century. It's usually filled with regulars, who in the past have included Roger Moore and Claudia Cardinale. You can arrive by boat or descend the steep hill. Plakada of Agiou is a small plaza in the center of Corfu town, and Piperitsa is an especially great spot for outdoor meals, coffee, and people watching: locals popping into St. Spyridon Church, children chasing pigeons, tourists strolling the quaint streets. This will most likely be the culinary highlight of your trip. Etrusco, tucked away in a residential area off the restaurant strip in the village of Dassia, was voted the best restaurant in Greece in 2013 by Athinorama magazine for the way internationally recognized chef Ettore Bottrini honors his Corfiot and Italian roots through traditional dishes with a molecular twist. The outdoor dining room combines the relaxing feel of a garden with the crisp linens and table settings you would expect of a fine dining experience. 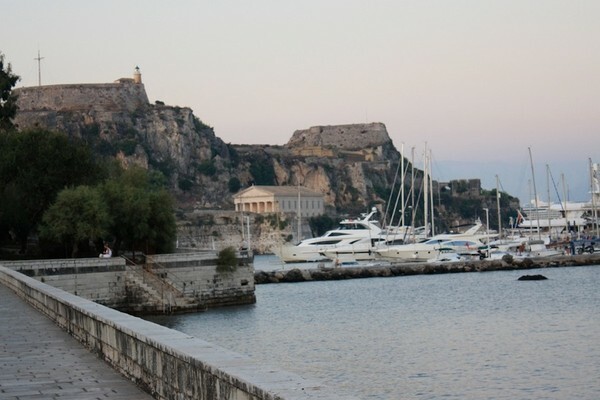 Fly: There are direct flights year-round from Athens to Corfu. During the summer months, there are dozens of charter flights from major European cities, which makes it easy to tack a week in Corfu onto a trip to London, Amsterdam, or Rome. Boat: Ferries from mainland Greece leave from Igoumenitsa many times a day. If you fly into Athens, tour the Peloponnese peninsula by car for a few days on your way to Patras or Igoumenitsa. You can also book ferries from Italy: from Venice, Ancona, Bari, and Brindisi. The Venice ferry is an overnight voyage. An added adventure to your trip. Yacht: If you visit Corfu on your own boat, dock at the marina in Gouvia near Corfu town. It has plenty of amenities, including restaurants, shops, and a pool on the gated and secured premises. Though you will give up a chance to swim in the sea due to cooler weather, Easter on Corfu is an experience of a lifetime. Every year, thousands flock to the unforgettable celebration, just as pilgrim's flock to New York City for the New Year's Eve experience. Only it's even better. Processions, candles, music, dancing and feasting: One need not be religious to marvel at the extravaganza. June and September are optimal months for beach vacations because the weather is perfect, with temperatures in the 80s and lows in the 70s. July and August are high tourist season and get very hot. Average temperatures are in the 90s with occasional heat waves when the mercury enters triple digits. Lawrence Durrell, the author of The Alexandria Quartet, used to live on Corfu. But to learn more about the island, read his little brother Gerald's book, , a light-hearted account of his childhood adventures on Corfu. Caroline writes the blog and heads up her own . She travels to see the world through other people's eyes.